Last year Upper Deck's SP Game Used brand got a complete make-over. This year, Upper Deck builds upon what they did for the 14/15. Like last year, SPGU now comes in a one-pack configuration. Originally it was a product that contained one hit per pack with boxes having five to six packs. SPGU is now condensed into one giant pack with multiple hits. Sadly, I did not get a base card in my pack... and no, it wasn't because Upper Deck goofed. The base cards in SPGU are actually pretty tough pulls. Each base card is limited to the player's jersey number, and that's all there are. In fact, there is a base card numbered to just 1, so it is only possible for one base set to be completed in the entire world. To me, that's really weird, but SPGU is not about set building. It's really about collecting the players that you want, and now base cards are actually tough cards to get a hold of. I know I'll be trying to track down Logan Couture who only has 39 base cards. Though some may not like it, I applaud Upper Deck for going this route. They are thinking outside the box and turning something like the lowly base card into something that could possibly be chased. It's a bold move, but this is the direction I can see the hobby going as it becomes more of a niche market catered to people with deep pockets. To add to the chase, the card with the player's jersey number (so in my case 39/39 for Logan Couture) will be autographed. These autographs are really one-of-ones as they are the only base cards that exist with an autograph on it. The score I'm giving the base cards considers the difficulty to get of the card and the look of the cards I've seen online. In terms of the way they look, the base cards look very much the standard for SPGU. Even the italicized serial numbering is a shout out to previous installments of the brand. It's not a great or memorable design by any means, but that's not what matters here. The front of the box says that collectors can find 5 autograph, memorabilia, or other premium hits per pack. In all likelihood, most of the hits will be jersey cards with maybe a patch and an autograph accompanying them. Base cards would be considered premium hits as they are now in rarer territory. Though this is just a triple jersey card, I like it as it displayed three different jersey colors on it. SPGU contains quite a bit of all-star memorabilia from last season's game, and this is an example of that. Having SPGU come out right as all-star fever is at its highest was probably a good move for Upper Deck as fans may still be hyped about it. Actually, if it had come out last week it may have been even better. Oh well! This medium sized jersey card is also from last year's all-star festivities. The jersey piece is presented on a pretty standard looking card for SPGU. The entire card is clean, but not very memorable. The muted grey colors don't help much... especially with plain jersey pieces. Thankfully, these cards also come in rarer patch variations. Having a killer looking patch on this card would work well as the dull background would help set the patch off more. 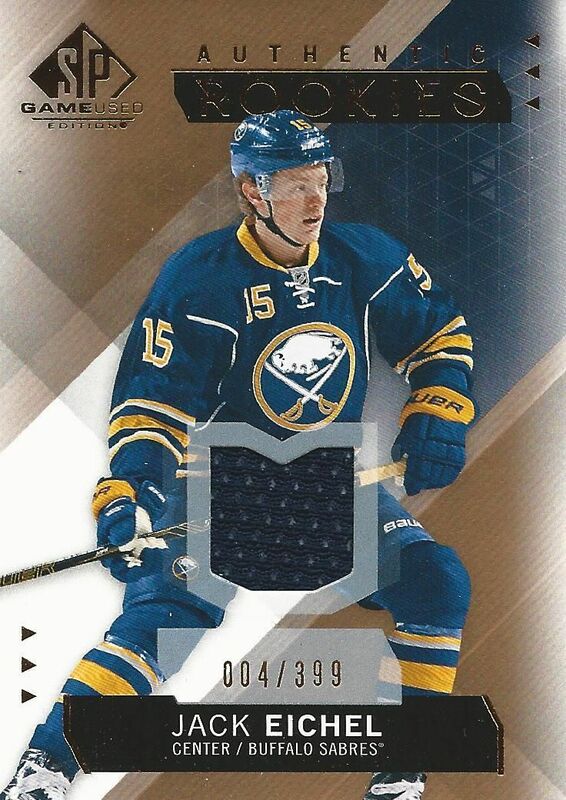 I got two of these Authentic Rookie jersey cards in my pack, the Eichel shown above and also Nikolaj Ehlers. Each cards comes with a pretty small piece of rookie photoshoot jersey as well as numbering to 399. Unlike the other SPGU cards, these ones stand out a bit more with its bronze look and foil highlights. It's just too bad they are regular jersey cards that probably won't be sought after too much. The best looking card from my pack was an Inked Rookie Sweater card numbered to just 49. The patch on my pull was pretty nice and helps the card look a bit better. Though the card has a sticker on it, Upper Deck has done a nice job of making it hard to see. Overall, the look of this card is top notch with the patch. I just wish I had gotten a more notable player. The pack I opened had some very standard hits in it. And that's too bad for me as I know there are some pretty spectacular looking things to find in the product. One of my favorites - Supreme Relics - features a very large piece of patch. There are also pieces of nets used in NHL events as well as puck cards. My box of SPGU wasn't particularly great. For well over $100, I basically got 4 jersey cards and a patch autograph of a lesser known rookie. That certainly doesn't make me very happy. But I do understand that SPGU is one of those very hit or miss products... and it always has been. Even when it was a different configuration, SPGU was a huge gamble for collectors. 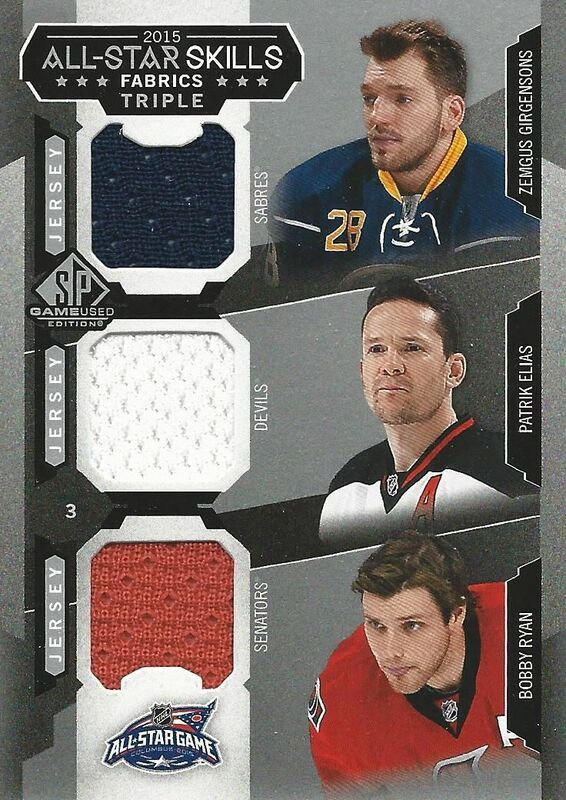 I actually still feel in a way that I am buying the old SPGU as I am still getting a bunch of jersey cards. I never bought SPGU by the pack anyways, so getting all the hits at once is pretty much the same opening experience. The only good thing is that the box price is a lot easier to swallow. Remember when SPGU was upwards of around $200? Yeah, crazy! There is certainly the potential to pull some great things out of SPGU, and I like that the base cards have added value by being pretty rare, but I just can't recommend SPGU as a very good product. The box value just isn't there. You'll just feel ripped off way too often than you'd like with this brand. Moving on! I totally agree with you but some cards look really nice. ALL Star stuff is kinda lame. but cool cards! Yeah I know what you mean, I always feel ripped off when ever I buy spgu. But good review! I wasn't expecting too much out of this and I see why. At least the price went down so it kind of make you feel better. There's some boxes with awesome cards and other boxes like yours, that's why I'll probably not buy a box of SPGU this year. Thanks for the video break and review as usual, Luke. Definitely have to agree that this box was not the greatest and the contents didn't offer much excitement. The design is alright, but I think that pretty much everyone is tired of pulling those lame white jerseys, especially from high-end products. The last two rookie materials were pretty good! Nice design, but too pricey. + The patch/autograph looked great! + Interesting idea with the "base cards"
- As always, there's too many jersey cards in this product! - Talking about the jersey cards, they're not even game used even though that's the name of the product. For example, I guess that your box only contained event worn memorabilia (photoshoot & All-Star Skills Competition). Shame on you, UD! While I agree on the base card issue, what I really care about in this product is the jersey/auto/patch cards. What I really liked about last year's SP Game Used is the Winter Classic Game Used jerseys. This year it has been replaced with the 2015 Columbus All-Star game. While I like the design of both this year and last year's card designs, I prefer the Winter Classic because the card design was nicer. 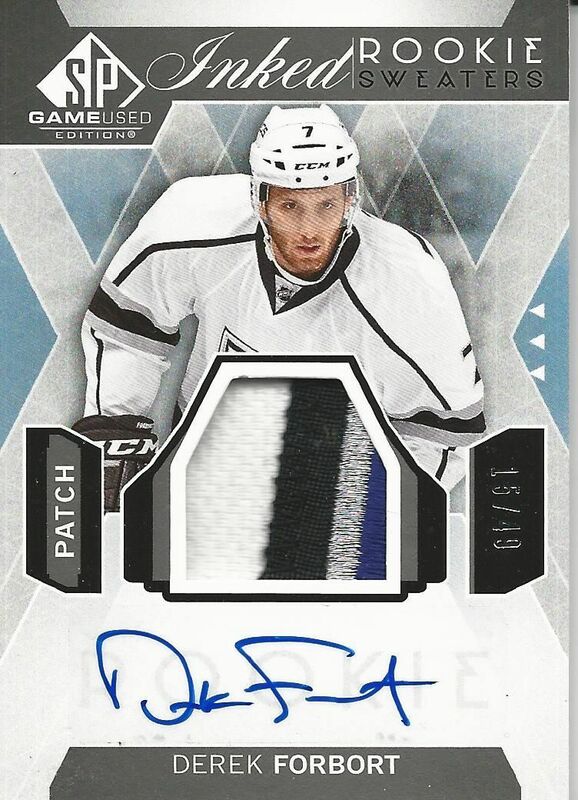 What I like about this year's product is the sweater/patch logos, an example would be your Derek Forbort card Blacksheep, because the card design looks stellar and although there is no action shot, the card design makes up for the loss. As for the rookie jersey cards, the card design could use a little more color compared to the bronze, but it's only a minor detail. Seems a little too pricey for the cards you did get even though they weren't that bad. I love that Ehlers card! Go Jets Go! 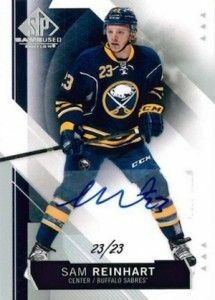 Very nice review, I think that This product is a homerun or strikeout, you dosen't get really lucky but you got Eichel who is a very nice rookie and Bergeron who is my favorite player. I think there was to many all star cards. The potential is there but I agree with your rating... It leaves u unsatisfied and wanting more. This year's SPGU wasn't as great as previous years in my opinion. Nice Ehlers and Eichel jerseys. Only one auto and not a really good one. Pretty much a hit or miss product. For the price of the pack, i think it's a bit overrated. The only nice but was the patch auto card, but even then it was an unknown rookie. SPGU is one of those products where you get something great, or something bad. Not worth the money in my opinion. Good Try, Like the cards anyway, but value is steep. Love the review as always,But I don't really like the all star stuff, it's not really "premium"
Great break!!!! Nice LA patch. Thanks for the break! The jersey number base is an interesting (and welcome) touch. i like this post, online cricket betting rates. awesome video, please more upload online cricket betting 365. For free and 100% Guaranteed cricket betting tips visit the Website, remember you can earn by trading not by betting.